Description: 1940's era searchlight signals installed by CSX predecessor Georgia RR have since been replaced at this location. Description: Q156 is heading eastbound here past Victoria's Inn. Sorry for the blury image as i had the wrong setting on the camera. Description: Heading into the morning sun detour train Q156 rolls past the old New Foundland train station and semaphore signal. Description: After setting out the mixed freight on the head end Q156 heads south smoking it up before entering back on to CSX tracks at CP3. 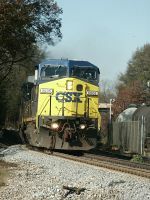 Description: CSX C40-9W 9006 leading a Union Pacific locomotive northbound train through the yard at Manchester, Ga. CSX C44-9W is reported to be Dash9 in a Dash8 carbody. Description: Q118 skirts along the banks of the Mohawk River. Description: But Check this out!!! 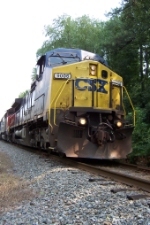 According to this site and my 2005 Official Roster CSX 9006 is a C44-9W. But.... Those are GSC trucks underneath! Somebody messed up didn't they? Description: Q326-10 with 5 cars?!?! Description: Smokin' it up and heading out of town, K891-16 with CSXT 9006 leading the two CN's. Title: C&O Clear at the diamond, Let's Roll!!! Description: CN 5671 is 3rd unit on K891-16 north at Hospital Street in Downtown Richmond. This train is empty molten sulfur tankers. 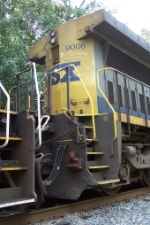 Description: A mixture of power from different railroads are sitting at UP’s Englewood Yard in Houston, TX.